In Greek Mythology, Sisyphus was a cunning mortal. When Hades, the God of the Underworld, came to take him down to the kingdom of the dead at the end of his life, Hades came prepared and brought handcuffs, which Sisyphus cunningly got him to demonstrate on himself - Sisyphus kept him locked in a closet. For this, and other crimes against the Gods, he was given an eternal punishment of being put to hard labour. His task was to push a boulder to the top of a hill, and when it reached the top and fell back down, he had to climb back down, and begin to roll it back up again. Exertion. Toil. Sweat. Ennui. 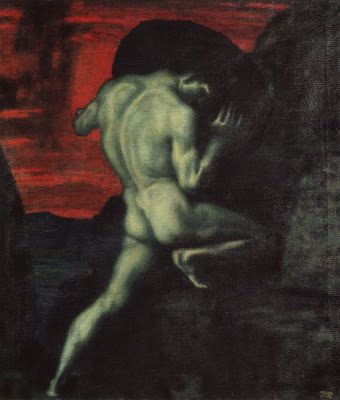 Sisyphus was resigned to his fate, and had little choice but to continue - pushing the boulder up the hill only to be forced to start again once he had reached the top. The French Existentialist philosopher Albert Camus saw this as a fitting metaphor for life in a futile world without meaning such as our own. In 'L'Etranger', translated as The Outsider or The Stranger, Camus' protagonist Meursault is the Sisyphean, absurd hero. Camus postulates that there is no objective purpose to our existence, but that this needn't necessarily be a source for pessimism. He identified three ways in which an individual could react, faced with the futility of their existence. They could deny that it lacks meaning, by creating false idols through religion, for example; by creating a God-as-purpose. To do this is to lie to oneself though, and to deny oneself the dignity of their autonomy, however futile their existence might be. Alternately, one could commit suicide, and suicide is the major theme in his philsophy - "there is but one truly serious philosophical problem, and that is suicide" - but if one's life is pointless, so would be one's death. If life is futile, it is yet more so to try and escape it. The third option, and the one which Camus and the existentialists generally promote, is to embrace the futility of life, to find those small insignificant acts in life that indulge you in sensorial pleasure, albeit subjective, and accept that life is meaningless. We're alive to the extent that we are conscious of ourselves, we don't have any obligations, we don't have any purpose, we don't have any 'meaning'. Whether you do good things or bad things, in the grand schema of life itself, it doesn't really matter. Any recognition or status acquired is subjective and is grounded in life itself - in terms of existence, it is meaningless. The fact is, we're here at the foot of this great bloody mountain and the boulder is there, waiting to be pushed, and there is no reason not to push it. This is pretty much life as a student here in Cambridge. Sisyphus had to push a rock endlessly up a hill for eternity, undergradutates have to write essays, make deadlines, make it to supervisions... But do we have to? Not really. Most students here are locked into Camus' first option of how to cope with the futility of our existence: denial. The NatSci grafts towards a new pathos in understanding the structure of plant cells, the Social Anthropolgist attempts to diagrammatise and bifurcate culture into binary opposition, the Philosopher ponders metaphysics, the Medic develops ways to keep people alive, the Lawyer memorises tomes of rules... but why? It is not the 'meaning' of the Plant Scientist to theorise on stomata. Structuralist analysis doesn't make the social anthropologists life any more meaningful... But nonetheless, we push on in our quest for knowledge, for a better career, to satisfy our parents, to keep ourselves from ennui, to avoid the job market. The legions of Sisyphean students sit in their accomodation and if you stand outside and face the windows, you can see them, hundreds of them spread over numerous floors - like Bentham's Panopticon - all sat at their desks, typing, reading, researching but ultimately, distracting themselves and constructing a subjective meaning for the inessense of their existence. Doing this only makes it more difficult to push the boulder. Whether we do it in acceptance or in denial, we have no choice but to push the boulder up the hill. So students, citizens, humans, find what pleases you, embrace it wholeheartedly, always remembering not to take yourself too seriously, and carry on heaving through life.